Anyone been dealing with Redline Performance Motors lately? 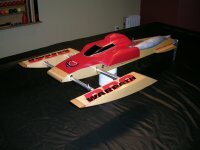 Looking or set up sheet or Warpath Pro. I have #25. Why do I see different Cowl on the same model hull Thank you Don.